Absolutely delightful Moon-Gazing Hare carving in Fluorite. HARE: The symbol and legend of the Moon Gazing Hare is steeped in ancient folklore. Pagans believed that to see a hare gazing at the moon would bring good fortune and abundance. It symbolised new beginnings, growth, fertility and re-birth. The hare was sacred to the Pagan goddess of the dawn; Eostre. Translated, her name means ‘shining east’, or ‘shining light of dawn’. She symbolised the coming of spring and represented purity, youth and beauty. With the advent of Christianity, Eostre and her mystical hare eventually became ‘Easter’ and the Easter bunny. The hot cross buns we traditionally eat at Easter were originally pagan offerings, hung in houses to ward off evil; with the cross on the bun representing the four quarters of the moon. FLUORITE: Often refered to as 'the most colourful mineral in the world', Fluorite can be found in virtually every colour of the rainbow. In the healing world it is one of the most versatille crystals around and on a psychic level it is known as one of the most protective stones. 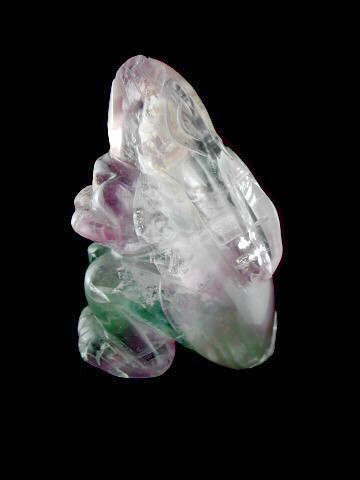 Excelllent to have in both the home and work environment, Fluorite absorbs negative energy from stressful situations, cleansing the etheric body as it goes. It shares similar metaphysical properties with Amethyst, yet has a higher vibration, and can help awaken our spiritual energies, or heighten existing ones. It is a stone of structure and progress and so can be useful to have in your environment when chaos reigns! It acheives structure by helping us to see clearly any given situation and to prioritize our actions. It can also be of great assistance when learning; helping us to better process new thoughts and ideas whilst improving mental coordination.